Beautiful beyond words! Love it! Gorgeous fan! I had an idea of how pretty it was from the pictures, but this fan is prettier in person!!! The metal part is very high quality, the lamp shade is real crystals with great shine. Blades have 2 sides, a brown wood color side, and a cherry wood finish side. Easy to install and it's very quiet when the fan is on. This fan has 3 speeds and it is very powerful on high. It does not come with light bulbs, needs 3. One thing they need to correct is the concept of the lampshade. If you have to change the light bulb, you have to remove the whole lamp shade which is very difficult because it is screwed in with 3-4 screws. Also, there's not much space to install the bulbs inside the crystal shade, so you may have to remove the lamp connections, which is attached to the fan, in order to change a bulb. Otherwise, beautiful fan, perfect for a classy bedroom. Even my husband loved it! This fan was just what I expected. It has that touch of glitz or sparkle I was looking for and is sleek and modern at the same time. My husband started off rolling his eyes but by end I think he had to admit it looked fabulous above out glass/chrome kitchen table. It was what I was looking for in my space. Wired it to wall switch and hid pull chains. Very pretty piece and works very well too. This is more than a ceiling fan. It is a beautiful part of the room decor. The housing and metal parts are black stainless steel which looks really nice with the crystals in the light fixture. The fan blades are dark brown on one side and dark cherry on the other. I used the dark brown in my room which has a black wrought iron bed frame and mirrored side tables. It fits in perfectly. The crystals in the shade form pretty patterns on the walls which I love. The light is dimmable making it perfect for a bedroom. And, from a practical standpoint, it moves a great deal of air. A solid fan with a glamorous feel. This lighted fan is really beautiful. It makes little prisms all over our bedroom. It isn't a super bright light with the bulbs we put in it, but it works pretty well for the space. The fan works well. The metal is beautiful and perfectly shiny. It comes with a few different sized downrods, and unfortunately our electricians installed it with the longer downrod. Our ceiling isn't super high, so someday we will take it apart and replace the longer downrod with the shorter one that it also came with. It is nice to have the option to do that. We're pleased with it, as it is functional but also prettier than most ceiling fans. This fan is beautiful. Best to get LED bulbs so you won't have to change for years. You have to detach the whole light fixture to change out bulbs. It's not easy to get the bulbs in, you need short bulbs. I switched out the pull chains, the one's that came with were ugly. You have to pull the chains from within the light fixture for them to hang correctly. Gives good air flow. Lights up nicely. Looks gorgeous! Have to admit for the price this is the best fan I've purchased. It looks great, has great airflow. It took about an hour to install, pretty easy, had a bit of trouble setting the crystal part into the fan but the rest was easier than other fans I've installed. It is a lot bigger than I thought, if it was installed in a main living area with eight feet ceilings forget it, I have to duck under the light. Looks like it's meant for 10-12 foot at least. The complaints about replacing bulbs, small hands can do it without removing the fixture, and even still, changing a bulb once or twice in its lifetime by removing two wires and a couple of screws isn't enough to pass on this beautiful fan. Wish it had a remote but definitely not a deal breaker. This fan is GORGEOUS when installed! My husband was a bit hesitant and reluctant, but once he installed it, he was sold, too. Be sure to make sure your fan is balanced, as to not have it shake too much. The crystals on this fan are definitely "blingy", but not so overwhelming like many that we've seen in high-end stores. We work hard to find that balance between super blingy, yet super functional. This fan cranks out some seriously cool air, too. Overall, highly recommend. Get the remote if you're able to -- you won't regret that decision! I am far from being an online customer fan but the reviews helped me with my purchase. I am an electrician and it had been somehow easy instalation however there have been challenges. I am very happy with the purchase but it is a hassle to install the light fixture. As far as the light bulbs you will need the 60 w candle but the small insert. If one of the lightsgoes off in order to change the light bulb the entire light fixture must come off. Despite the hassle I’ll buy it again without a doubt. 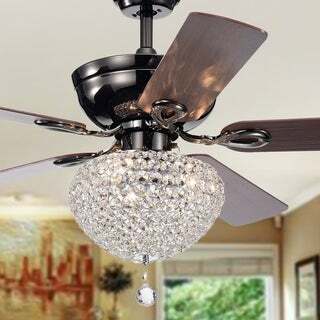 This ceiling fan is very beautiful,one problem I have is the pull chain sometimes get stuck in the crystal basket. This fan is so pretty. My husband HAS to have a fan over the bed and I wanted something a little different that had a glam vibe without feeling too feminine. I think this fits the bill perfectly! Adds a little sparkle to the room when turned on and even when natural light hits the crystals. Fan is quieter than others Ive had. So happy I found this. It's a great price too as compared to similar styles. It’s a really very beautiful ceiling fan!!! But also is little bit noisy on high speed mod rotation. My husband and son installed together. Remote control is working great! Yes, a longer rod can be used. Mine is setting at a 24 inch. I had it at a 36 but that was to low because I bought a bed that is very high. Also consid the light kit, my old fan didn’t have a light kit, so it didn’t hang as low. I adore this lighting fixture/fan. The crystal is what caught my eye and it is what really makes this fan stand out. It has a dark metallic look but the crystal globe when lighted, is really lovely. it is glamorous without being glitzy, which is the idea. This light is gorgeous! There is plenty of light and we don't feel dizzy when the fan is on with the light. I was worried it would feel like a disco ball, but it's not like that. It is so classy and the darker metal matches the lamps I have! We love it! This is a very nice fan. I wanted something elegant in my bedroom and this did a great job adding to my decor. It does not come with a remote control which is a negative but we did purchase a third party remote and my husband was able to easily install it. Just enough bling without being over the top. Very classy. Great addition to my daughter in law's home office. Easy to install. Chains pull easily and don't get caught on crystals. Highly recommended. Great Ceiling fan. It has a nice look. I recommend. We love this ceiling fan. A friend came over who hates the look of ceiling fans, but couldn't believe how nice this one looks. I love the crystals, it looks great!! This fan is gorgeous. The only bad thing is the pulls have brown knobs, they should have been crystal.